Readings: Jer 18:18-20; Mt 20:17-28. 1/ First Reading: NAB Jeremiah 18:18 "Come," they said, "let us contrive a plot against Jeremiah. It will not mean the loss of instruction from the priests, nor of counsel from the wise, nor of messages from the prophets. And so, let us destroy him by his own tongue; let us carefully note his every word." 19 Heed me, O Lord, and listen to what my adversaries say. 20 Must good be repaid with evil that they should dig a pit to take my life? Remember that I stood before you to speak in their behalf, to turn away your wrath from them. 2/ Gospel: NAB Matthew 20:17 As Jesus was going up to Jerusalem, he took the twelve (disciples) aside by themselves, and said to them on the way, 18 "Behold, we are going up to Jerusalem, and the Son of Man will be handed over to the chief priests and the scribes, and they will condemn him to death, 19 and hand him over to the Gentiles to be mocked and scourged and crucified, and he will be raised on the third day." 20 Then the mother of the sons of Zebedee approached him with her sons and did him homage, wishing to ask him for something. 21 He said to her, "What do you wish?" She answered him, "Command that these two sons of mine sit, one at your right and the other at your left, in your kingdom." 22 Jesus said in reply, "You do not know what you are asking. Can you drink the cup that I am going to drink?" They said to him, "We can." 23 He replied, "My cup you will indeed drink, but to sit at my right and at my left (this) is not mine to give but is for those for whom it has been prepared by my Father." 24 When the ten heard this, they became indignant at the two brothers. 25 But Jesus summoned them and said, "You know that the rulers of the Gentiles lord it over them, and the great ones make their authority over them felt. 26 But it shall not be so among you. Rather, whoever wishes to be great among you shall be your servant; 27 whoever wishes to be first among you shall be your slave. 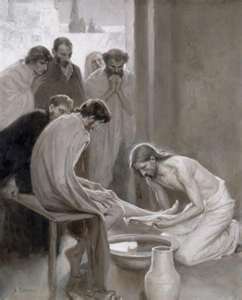 28 Just so, the Son of Man did not come to be served but to serve and to give his life as a ransom for many." I. THEME: A good leader is the one who serves and suffers for others. People are thirsting of power, title and position in the society; because when they have power, they can give orders; when they become famous, they will be known by many; and when they are in higher position, they will be served by others. To achieve these things, many people find every possible way to get ahead of others, some even use wicked way to destroy others. These ways can be normal to worldly leaders; but God prohibits them from religious leaders. Today readings are centered around these two kinds of leaders. In the first reading, the prophet Jeremiah felt discourage because after he tried to help people to return to God, the leaders of people didn’t recognize his good will, but also organized meeting to devise a wicked plan to destroy Jeremiah. In such a situation, a religious leader is easily hurt, gives up, and even asks God to destroy people. In the Gospel, when Jesus announced his Passion the third time, the mother of James and John came to Jesus and asked him to "command that these two sons of mine sit, one at your right and the other at your left, in your kingdom." This caused a disunity between Jesus’ disciples. Jesus must gather them around him and teach them the way to become spiritual leaders: they must serve and suffer for others. 1.1/ A prophet must suffer: This is so obvious since a prophet must speak what God commands him to speak, and this message people don’t want to hear. The false prophets speak what people want to hear so they are loved by people. The prophet Jeremiah must speak what the Israelites didn’t want to hear, such as: war, destruction and exile; therefore, it isn’t a surprise when he must endure sufferings. The leaders of people organized a meeting and said to each others: "Let us contrive a plot against Jeremiah. It will not mean the loss of instruction from the priests, nor of counsel from the wise, nor of messages from the prophets. And so, let us destroy him by his own tongue; let us carefully note his every word." They forgot that God is the One who controls everything that happen in the world. They can cause sufferings for Jeremiah; but can’t stop God’s wrath which are going to pour upon them. (1) He wanted to put all human sufferings and punishments on himself: This idea was announced by Isaiah in the Fourth Servant Song: “It was our infirmities that he bore, our sufferings that he endured, while we thought of him as stricken, as one smitten by God and afflicted. But he was pierced for our offenses, crushed for our sins, upon him was the chastisement that makes us whole, by his stripes we were healed” (Isa 53:4-5). Jesus must redeem people by sufferings to safeguard God’s justice. (2) Human beings are easier to be conversed by love than by command: In the Old Testament, many times God commanded people to keep His law; but people were still disobedient. In the New Testament, God wants people to see the Suffering God so that people might understand His love for them and return their love. When people feel the love, they shall know how to live better. 2.2/ James and John’s mother asked for power: The petition which the mother of James and John was asking for, can be understood according to human standard since most of human mothers would like their children have a good future. Moreover, if their children have a glorious future, a mother can also share in their glory. Jesus was very patient to explain for her: "You do not know what you are asking. Can you drink the cup that I am going to drink?" They said to him, "We can." Since they were thirsting for power, they answered “Yes;” but if they understood “the cup” which Jesus was going to drink, is his Passion, they will probably take back their answer. Jesus replied, "My cup you will indeed drink, but to sit at my right and at my left (this) is not mine to give but is for those for whom it has been prepared by my Father." All spiritual leaders should imitate Jesus to patiently explain for people to grasp what is beyond their limit. 2.3/ Ten other apostles got angry with that two brothers: People are jealous when they see others who have a better part than them; this happens because most people want the highest position. This is also the main cause which can destroy the harmony and unity of a community. If this can’t be fixed, a community will easily be dissolved. Recognized this danger, Jesus gathered the Twelve and taught them a lesson: "You know that the rulers of the Gentiles lord it over them, and the great ones make their authority over them felt. But it shall not be so among you. Rather, whoever wishes to be great among you shall be your servant; whoever wishes to be first among you shall be your slave." Jesus wanted his disciples to understand the difference between two ideals and two ways of leading. If the ideal is different, the way of leading must also be different. The ideal of Jesus’ disciples is to lead people to God, not to achieve power and fame of this world; so the way of leading must also be different, they must serve and sacrifice so others can be saved. Jesus used his life to be an exemplar for them: “Just so, the Son of Man did not come to be served but to serve and to give his life as a ransom for many." - The desires for power, title and position happen everywhere, even in the Church, the religious community and the family. Jesus’ disciples must avoid these desires; if not, they shall be anxious, angry and even giving up their vocation. - Jesus taught us to be different with worldly leaders because our goal is different with them. We must sacrifice by serving and by suffering for others to be saved, not for material gains.